A major focus of the laboratory is the study of mechanisms that regulate muscle contraction. In particular we use a variety of techniques including molecular biology, biophysics, cell biology, imaging (Live5 Zeiss Confocal), and structural biology to gain better understandings of the regulation of calcium release channels on the sarcoplasmic reticulum that control excitation-contraction (EC) coupling in cardiac and skeletal muscle. There are opportunities for graduate students and postdoctoral fellows to head their own projects using any of the various techniques that we employ to examine the regulation of calcium signaling and muscle function in normal and diseased states. In addition the laboratory has developed numerous genetic mouse models (primarily knock-ins and knock-outs) that are available to address specific questions concerning the regulation of key signaling pathways that control muscle contraction - in both cardiac and skeletal systems. Much of the work in the laboratory is "translational" in that it leads directly to understanding the molecular basis of human diseases including heart failure and sudden cardiac death. In addition, novel therapeutic approaches are being tested including those that fix the "leak" in the RyR2 calcium release channel that causes heart failure and sudden cardiac death. In addition, there are projects focusing on gaining better understandings of cardiac muscle growth and excitability, T cell and B cell activation, as well as vascular smooth muscle proliferation. The latter project has lead directly to the development of the drug eluting stents that are currently used for patients with coronary artery disease. Brillantes AB, Ondrias K, Scott A, Kobrinsky E, Ondriasova E, Moschella MC, Jayaraman T, Landers M, Ehrlich BE, Marks AR. Stabilization of calcium release channel (ryanodine receptor) function by FK506-binding protein. Jayaraman T, Ondrias K, Ondriasova E, Marks AR. Regulation of the inositol 1,4,5-trisphosphate receptor by tyrosine phosphorylation. Marx SO, Ondrias K, Marks AR. Marx SO, Reiken S, Hisamatsu Y, Jayaraman T, Burkhoff D, Rosemblit N, Marks AR. PKA phosphorylation dissociates FKBP12.6 from the calcium release channel (ryanodine receptor): defective regulation in failing hearts. Marx SO, Kurokawa J, Reiken S, Motoike H, D'Armiento J, Marks AR, Kass RS. Requirement of a macromolecular signaling complex for beta adrenergic receptor modulation of the KCNQ1-KCNE1 potassium channel. Wehrens XH, Lehnart SE, Huang F, Vest JA, Reiken SR, Mohler PJ, Sun J, Guatimosim S, Song LS, Rosemblit N, D'Armiento JM, Napolitano C, Memmi M, Priori SG, Lederer WJ, Marks AR. FKBP12.6 deficiency and defective calcium release channel (ryanodine receptor) function linked to exercise-induced sudden cardiac death. Wehrens XH, Lehnart SE, Reiken SR, Deng SX, Vest JA, Cervantes D, Coromilas J, Landry DW, Marks AR. Lehnart, S. , Wehrens, X., Reiken, S., Warrier, S., Belevych, AE, Harvey, RD, Richter, W., Jin, S.- L. C., Conti, M., and Marks, AR. Phosphodiesterase 4D deficiency in the ryanodine receptor complex promotes heart failure and arrhythmias. 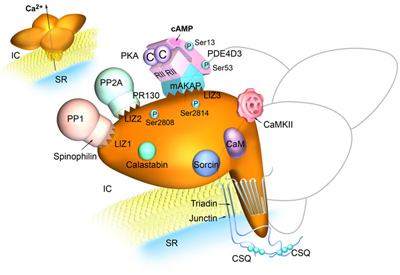 Hypernitrosylated ryanodine receptor/calcium release channels are leaky in dystrophic muscle.